Discarded, broken or obsolete electronics all go somewhere. As the founder of the Basel Action Network, Jim Puckett says, “Remember that when you throw something ‘away,’ it doesn’t just disappear. There’s no magical place or hidey hole called ‘away’.” “Away” is a place that can be a local landfill, a village in China or a slum in Ghana. But it is always a place we should care about. You want your broken electronics gone. That’s what a trash can is for right? Wrong. A trash can is not a magical “away.” Think of it as the opening of the pipe leading to a local landfill or an incinerator. Either option means that toxic materials from your electronics stand a good chance of polluting our environment, poisoning our water, soil, wildlife, and our neighbors. Many thousands of tons of old electronics, games, stereos, computers, and cell phones are sitting at home in garages, closets, and drawers. Many informed consumers know not to throw e-waste in the trash, and refuse to take it to a recycler for fear it’ll be exported, or their data read. Unfortunately, the re-use value of electronics diminishes very rapidly, For this reason, it is far better to hand it over as soon as possible to an e-Stewards certified recycler so they can refurbish your device and maybe even give you money for it. An e-Stewards certified recycler can give the device a second life, saving considerable resources and energy. Taking your electronics to any e-waste recycler seems like a good idea. Sadly though, by doing so you take a big gamble. 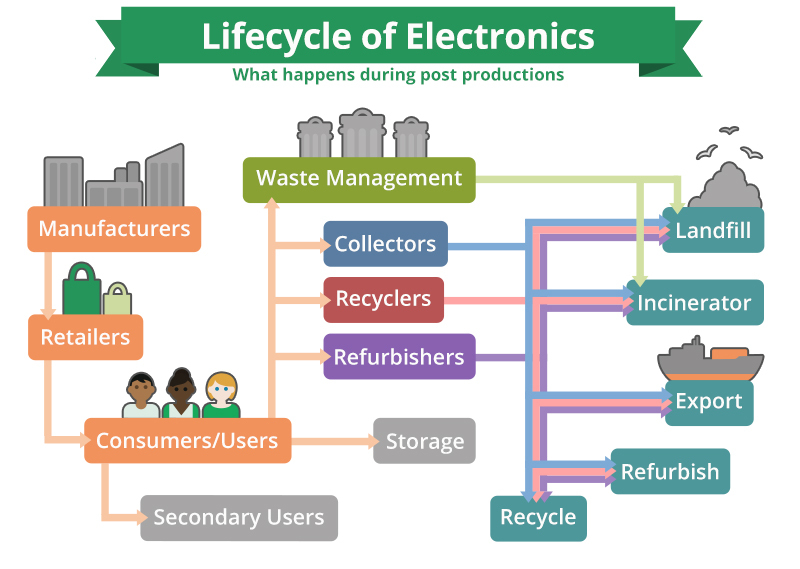 Many “electronics recyclers” will take your equipment and simply externalize what should be their costs for proper electronic recycling to the local or global environment. Without the assurance of the e-Stewards certification, it is doubtful your e-waste will be recycled safely, ethically, and responsibly. It could end up being taken apart by prisoners poorly protected from the hazards, or stockpiled in warehouses only to be later abandoned. E-waste could likely go to companies that don’t take the time to completely remove your personal data. Worse, it could also go the route of what industry experts believe happens more than 50% of the time—if you take your equipment to just any electronics recyclers—your old electronics could end up in a village in China or or a slum in Ghana, Nigeria, or India.